Stores reference 22c/1051, Size 5 (ht. 5'8" - 5'11", ch. 33-37", wt. 29-38", St. 36 -39"). 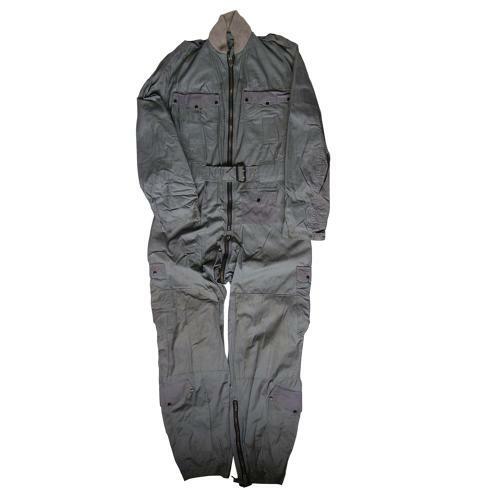 The 'Beadon' suit, or as it is correctly termed, 'Lightweight Flying Overall', was introduced late in the war as a replacement for the Sidcot flying suit. Manufactured in a grey gabardine 'ventile' fabric, this one-piece suit has a full front zip fastener from waist to neck and twelve pockets for the stowage of survival/medical equipment and rations, much of which is similar to that carried in the tropical survival kit. The material is generally in good condition and reasonably clean although a bit faded at the front and with grubby knees. There is a tear on the left sleeve but no material is missing and a repair would be quite simple. There is another small tear at the centre of the back and a scattering of small (moth?) holes under the left epaulette. All the zips are original, War Department broad arrow marked, complete with cloth puller tags, and function correctly. The knitted collar has a few small moth holes but the cuffs are very good. Complete with integral belt, inner back pocket, cloth hanger and label. A decent used example that would be easy to improve with some easy sympathetic repairs. These are becoming surprisingly hard to find now - many having been used as overalls after the war. Stock code S457.